Infrared (IR) is a cheap and (as you'll soon discover) easy way to add wireless control to your project. The IR Control Kit gives you everything you need to take control of the extravisible light waves (or are they particles? ), so you can remotely control your custom music box or build a controller for your TV or stereo. A CR2025 Coin Cell Battery for the remote. 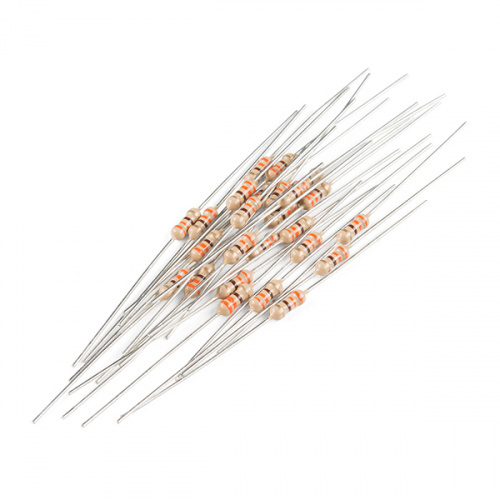 A handful of 330Ω resistors. You can never have enough current-limiting resistors. An Arduino (or Arduino-compatible board) and a means to program it. A breadboard is optional but recommended to help with the hardware hookup. As with the breadboard, jumper wires are optional but the recommended tool to wire between breadboard and Arduino. The second of the examples uses a common cathode RGB LED to create a fun, IR-controlled RGB LED project. This is optional. The third example uses a simple momentary push-button to trigger an IR code transmission. Optional again. 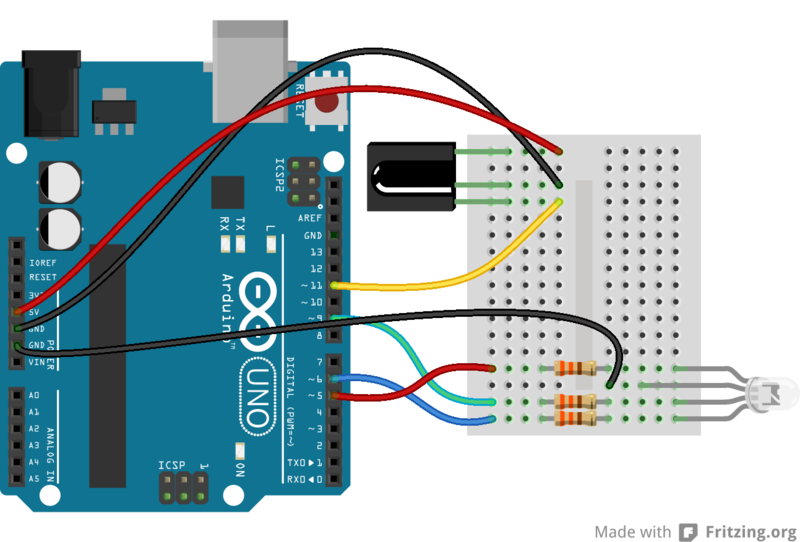 This tutorial explains how common infrared (IR) communication works, as well as shows you how to set up a simple IR transmitter and receiver with an Arduino. Before we dig into wiring stuff up and uploading sketches, let's quickly overview each of the components in the IR Control Kit. 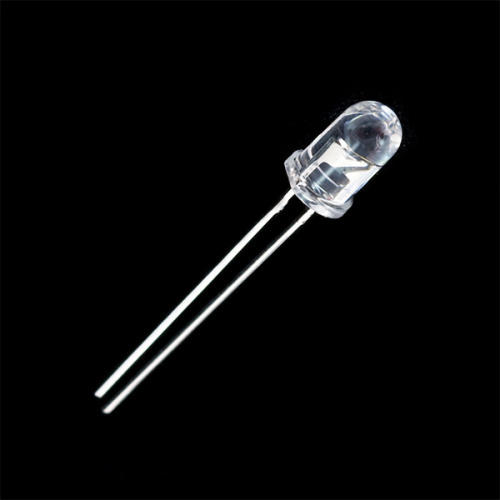 Let's start with simplest of the components first -- the infrared LED. Anyone who's ever worked with electronics has blinked an LED, but those blinking LEDs are usually in our visual spectrum. These IR LEDs are just like any LED you've blinked before, but they emit light at a wavelength of about 950nm -- radiation well outside of our visual range (about 390 to 700nm). You can't see these LEDs light up, but you can still use them just like any LED. They still have two polarized legs: an anode (positive, the long leg) and a cathode. They have a typical forward voltage of about 1.5V, and a maximum forward current of 50mA. For more specs, you can check out the LED's datasheet. Just as with any LED, the IR LED needs a series resistor to limit current. That's what the included 330Ω resistors are for. 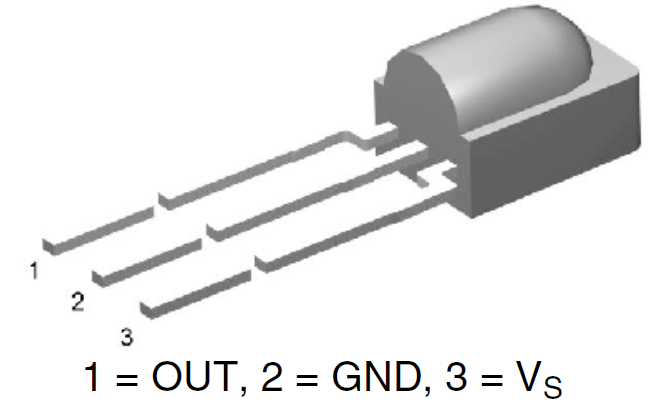 With a 5V supply connected to the resistor/LED series combo, current through the LED should be limited to about 10mA, which is well inside its safe operating range. 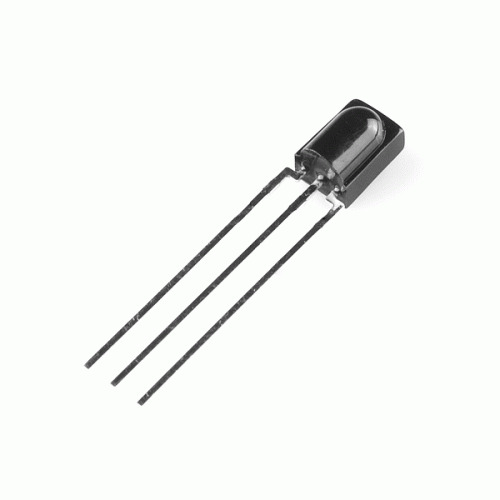 While it may look like a simple transistor, the TSOP38238 IR receiver module is actually a unique, light-demodulating integrated circuit. With three pins, it's about as simple as an IC can get. There are two pins for power -- ground in the middle, and VS to a side -- and one, single data output pin. The IR receiver can be powered at anywhere from 2.5V to 5.5V, so it plays very nicely with a variety of development boards. So all we have to do to read the output of this device is count high and low pulses, and measure their durations. For more information on the TSOP38238, check out its datasheet. Note: You will need to press the button multiple times in order to send more than one button press to the IR receiver. If you hold the button down, the example code may read 0xFFFFFFFF. 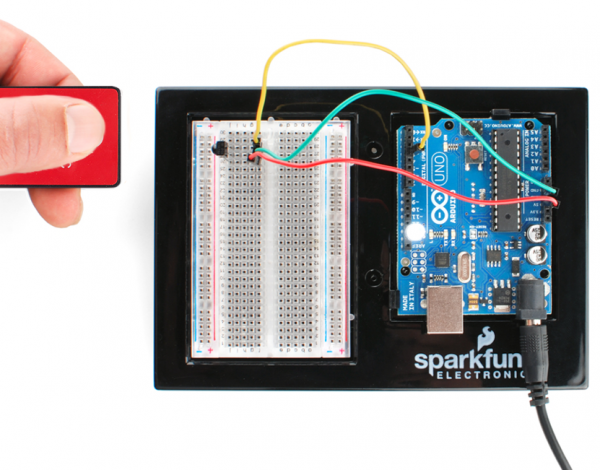 Finally, we come to the flashy part of the kit: SparkFun's custom-made Infrared Remote Control. 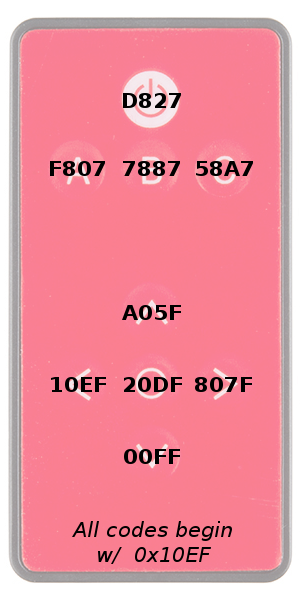 The nine button remote emits unique 32-bit codes for each button press. The codes are mapped as shown in the images below (this will come in handy in our first example). Depending on the IR remote that you are using, the values may be different. The remote's infrared output signal is modulated at 38kHz, so it works perfectly with the IR receiver module. 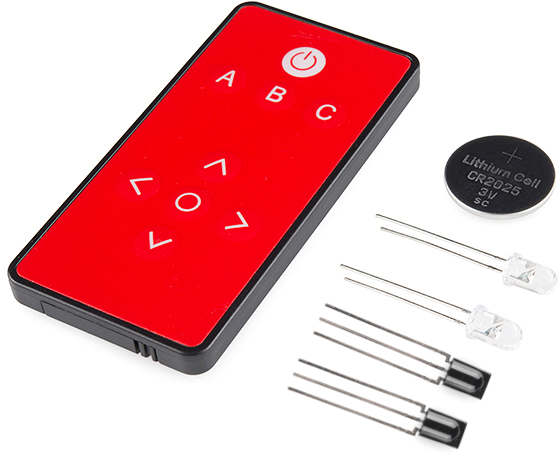 Note: If you are buying the IR remote control seperate from the kit, the unit does NOT come with a CR2025 coin cell battery. You can use a CR2032 battery, but we found they get stuck easily because they’re slightly too thick. It’s recommended that you use the CR2025, it fits well. The IR remote doesn't come with a battery installed but the IR Control Kit includes one for it. The battery compartment can be found on the bottom edge of the remote. To open the battery compartment, pinch the latch with your thumbnail while pushing the drawer out with another fingernail. Insert the battery so that the positive (+) side is facing the bottom of the remote. Then slide the battery drawer back in. Warning: Make sure the folder name that you copy into your "libraries" folder is named "IRremote". Use of the ` - ` in the directory name can lead to errors in compiling the code. The IRremote library is a powerful tool for adding IR to your project. Whether you want to send IR codes out to an appliance, or transmit IR codes from a remote to your Arduino (or both!). We'll go over some of the simple stuff you can do with the library. For more help using it, check out Ken Shirriff's blog. Ready to start hooking everything up? Check out the circuit diagram below to connect the components together. Copy and paste the below code into your Arduino IDE. Then upload it to your Arduino to view the values associated with each button. hex value when a signal is received by an IR receiver. Note: This is based on Ken Shirriff's code found on GitHub. //Note: Uncomment out this section if you are using this w/ the older remote. //Note: Comment out this section if you are using this w/ the older remote. Open a serial monitor at a 9600 baud. Press the buttons on the IR remote to see the associated button values. If you have an older version of the IR remote control or received one outside of our catalog, make sure to update the code to reflect the corresponding button presses. Simply comment/uncomment the code for the remote or update the values for the remote that you are using. Now that we can read the button presses, we can control your project with IR! In the first example, we'll show how you can connect the IR receiver to an Arduino, and control it with the IR remote. In this first example, we'll use the IR receiving capabilities of the IRremote library to use the SparkFun IR remote to control a common cathode RGB LED. An RGB LED isn't included with the IR Control Kit, but it might be something you've already got in your parts box. If not, any set of three will do. Or you can even just use the serial monitor as your output monitor. The output of the IR receiver connects to D11, but it could be connected to any digital input pin. If you swap pins, make sure you reflect those changes in code! We don't have a use for the IR LED yet, so, for now, set that safely aside. Copy and paste the below code into your Arduino IDE. Then upload it to your Arduino to create your very own, remote controlled, RGB LED. and down arrows increment or decrement the LED brightness on that channel. circle set it to the middle. version) should be connected to the Arduino's pin 11. Arduino's 5V and GND rails. 5, 9, and 6 (red, green, and blue pins). boolean ledEnable = 1; // Start with the LED on. Serial.begin(9600); // Use serial to debug. // end it updates the RGB LED. // serial output, and has an effect on the LED output. When the code initializes, the RGB LED will be set to a certain brightness. Then we're basically looping and checking to see if the IR receiver diode has received a known code from the IR remote. If so, it'll have some effect on the LED -- turning it on/off, turning up or down red/green/blue, etc. 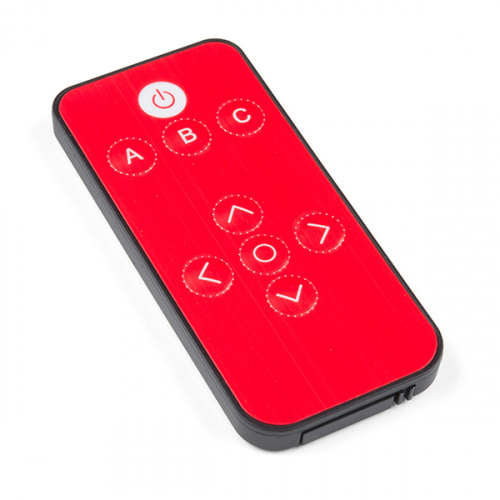 Pressing on the buttons A, B, or C will allow you to adjust the corresponding color. Once a letter is pressed, you can adjust the brightness with the direction pad. Check the comments in the code for help understanding what's going on. You can also check the output of the serial monitor to make sure the codes are being received. When a known code is received, it'll print out the corresponding button. When an unknown code is received (which shouldn't be often, if ever, if you're only using the SparkFun IR remote), it'll print that code out in hexadecimal. Heads up! When the red LED is fully turned on, it may dominate over the other colors. Try turning it down by using a smaller value. For ideas on making your own custom colors, try looking at the LilyPad protoSnap Plus Activity Guide: 3. Custom Color Mixing for ideas. That's all there is to it! Try exploring the code and replacing the RGB LED with other devices you can control. How about a servo motor? Or a relay! There are so many possibilities! Do you have other IR remotes around? Try them out! As you press a button, check the serial monitor (at 9600 bps) to see what code it spits out. Then add a case for those in the switch statement. After you've gotten the remote and receiver working, it's time to add some IR transmission to the setup. For this example, we'll set up an infrared data relay using both the receiver and an IR LED to transmit data. IR codes received by the Arduino can be sent out the LED by the press of a button. 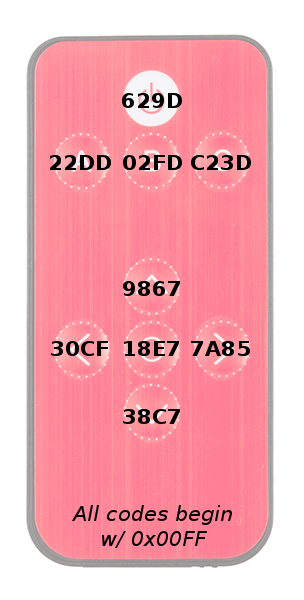 On the hardware level, using the IRremote library, there's only one pin we can use to transmit IR data: pin 3. There's not any give here; pin 3's PWM-capabilities make it one of the best choices for transmitting the 38kHz modulated IR data. Once you've got the hardware all wired up, copy and paste the code below. Then upload it to your Arduino. This sketch uses the IR receiver diode to "record" an IR code. that IR code out of an attached IR LED on pin 3. Ohm resistor, which connects to ground. 12 of the Arduino on the other. const int buttonPin = 12; // Button pin. Pulled up. Triggered when connected to ground. // setup() initializes serial and the Infrared receiver. // loop() checks for either a button press or a received IR code. sendCode(); // Sends out our code. (See bottom of sketch). * irLen -- The length (number of marks and ticks) of an IR code. will contain the received code. contain the format of the received code. This function borrows heavily from the IRrecord example code. // Don't record a NEC repeat value as that's useless. To use the sketch, you'll still need an IR remote. Begin by opening the serial monitor (at 9600 bps). Then press a button on the remote. The serial monitor should notify you that a IR code was received. The Arduino's now all loaded up, ready to spit out its own IR code. To send out the IR code, press the button connected to pin 12 (or just short a jumper wire from 12 to GND). 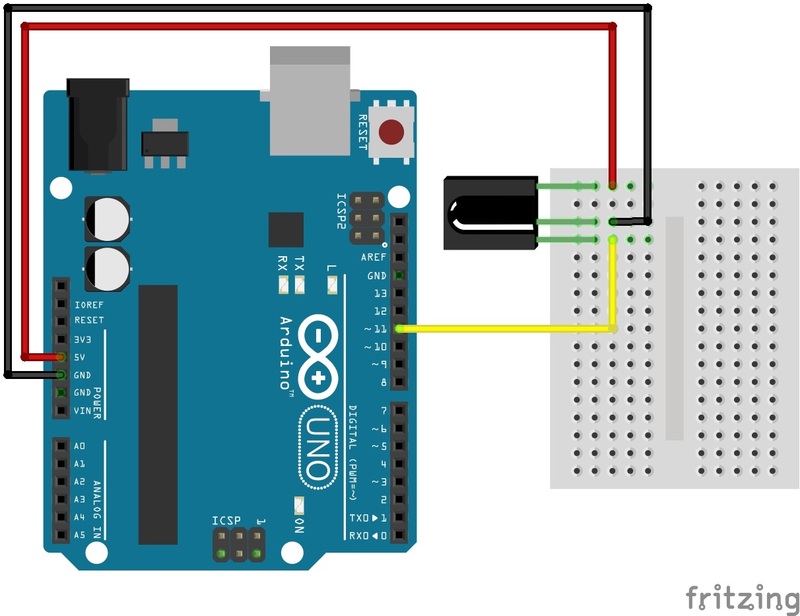 The way the example code is written, the IR LED will send the IR code once until the Arduino receives another IR code to record. Unless you have a device that is looking for specific IR codes, you may not see anything happen. Try the sketch out with some IR remotes and appliances around your house. 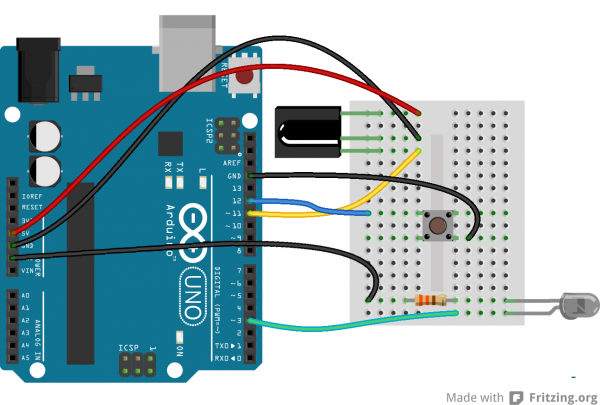 Can your Arduino trigger your TV to mute? If you don't have an appliance matching any of those manufacturers (NEC, Sony, DISH, Sharp, Panasonic, JVC, etc. ), you'll have to use the sendRaw function to transmit your IR code. Looking for more power? Infrared LEDs are awesome. Along with an IR receiver they can be used for remote control and even basic remote data communication. The only problem is that your Arduino won’t drive them to their full potential. The transmission range of the LED might not be optimal. Output pins on the Arduino can only source up to about 30mA of current. This means the LED cannot be driven to its full power of 50mA. This will result in a loss of transmission distance. If you want to drive an IR LED properly, consider using the IR LED with a transistor and resistor that was used in the design of the old SparkFun Max Power IR LED kit. To control, simply provide it with voltage (5V), ground, and connect the CTL pin to a digital pin on your Arduino, and you can drive this kit just like a normal LED. However, a 330Ω attached to your IR LED should give about 10 feet of range. Using the OpenSegment -- Along the lines of visible displays, the OpenSegment 4-digit 7-segment displays are an easy tool to add data displays to your project. Rebuilding the Illumitune -- Learn how we integrated IR into the Illumitune project we helped rebuild. Laser Limbo -- Build a "Laser" limbo using IR LEDs and IR Receivers!